If you are new to this project and would like to start at the beginning, here is a link to the first post. 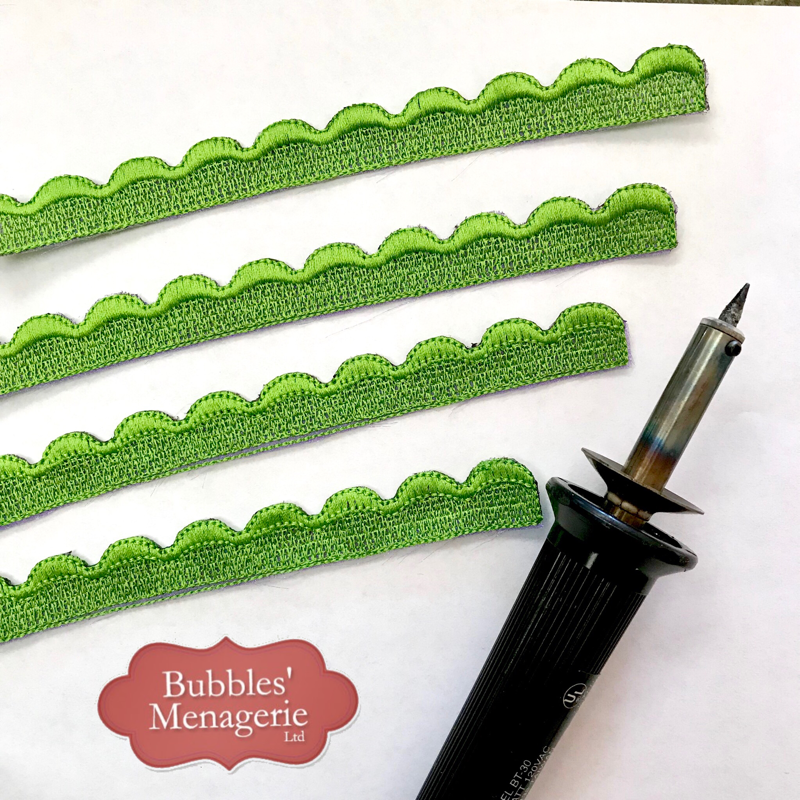 The first mini-project in this embellishment adventure was to create the scalloped edge. This part of the project evolved over a week of chatting with friends, reading the pattern, looking at the patterns in the fabric, playing in the software AND creating test sews. Digitizing designs for a “creative destination” such as this is so much more than opening software and clicking buttons. This post will talk about that journey. When mixing fabrics with different patterns, it takes me time to get comfortable with the roles that each pattern will play in the project. I had decided that I wanted the geometric print to be the base of the bag as well as the flap and handles. Deciding on the embroidery embellishment was an evolution of ideas. The paisley print has these lovely scallop shapes worked into the pattern. 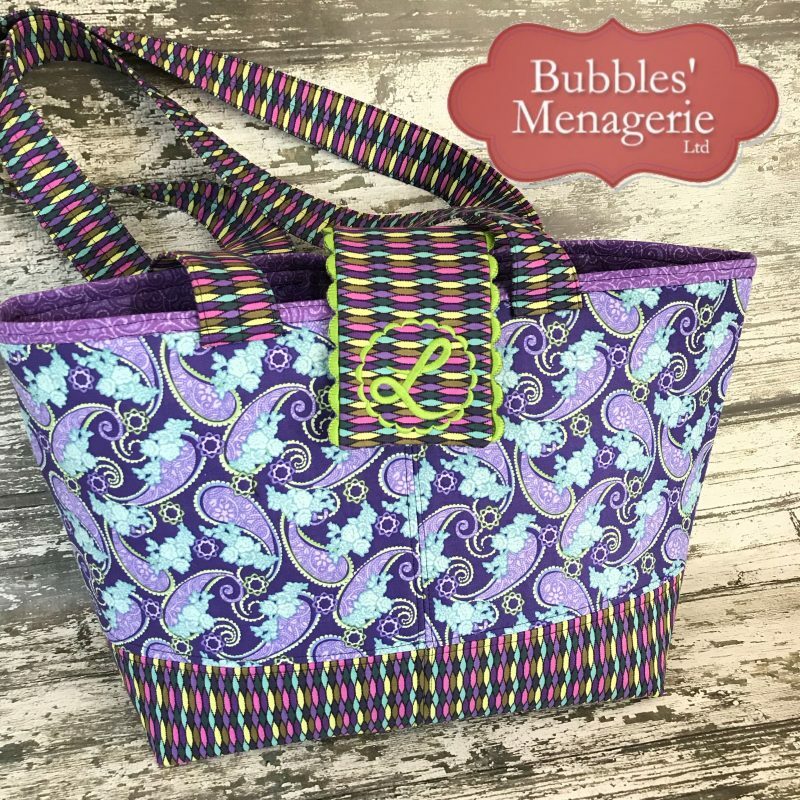 My first thought was to create a free standing lace edging, but I soon recognized that this tote was going to be a functional workhorse so any stitched edging would need to have some sort of foundational support. I created the scallop but before I even went to the embroidery machine, I thought about how I would attach this scallop to the flap. 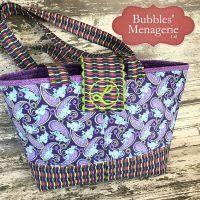 It seemed rather “fussy and delicate” and that wasn’t what I had in mind for this tote. So right off the bat, I dropped the free standing lace idea and hooped the organza. I happened to have purple and thought that if I stitched on the purple, a bit would show thru the “tunnels” and coordinate even more. I was creating the designs in Embrilliance StitchArtist using a satin column with free standing lace underlay to give the stitches enough body. I worked on small samples of these edges even though the final piece would be about 7” long. No need to create full size versions during this test sew period. My first test was only a couple inches so I was working in my 4×4 hoop. I knew that there was going to be more than one test sew, so I made sure to move it to the far edge of the embroidery area so that I could fit more in a hoop. You can see the progression in test versions because of the different colors. 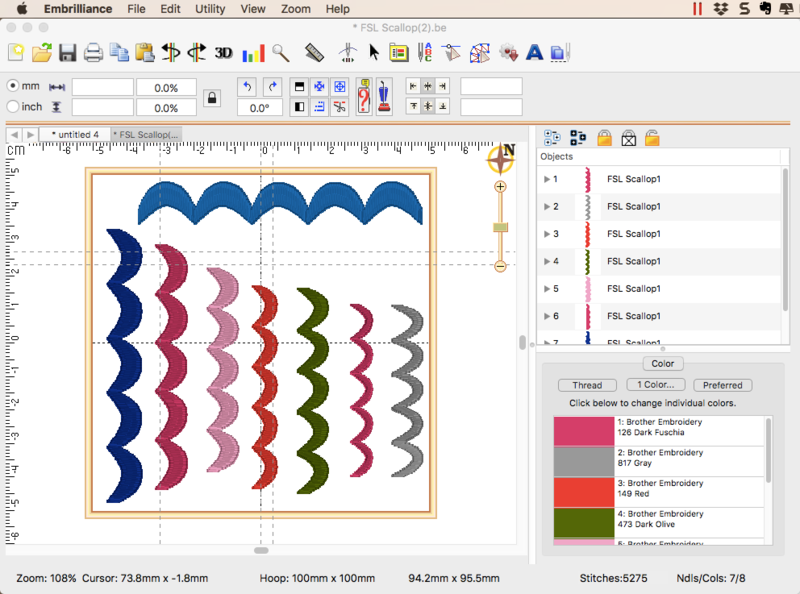 Changing each to a different color allowed me to re-load the design to the machine…..move it all the way to the right and skip to the color of the next scallop. By the time I got to the last scallop, I realized that I could have added a basting box and skipped moving the design at the machine each time – learn something all the time! I would stitch, analyze, adjust and stitch the next version in the same hoop until the hoop was full. As you can see, I sort of trimmed them out and as I got closer to the final version, I realized that the organza was not going to be enough. The edges I had created were already starting to curl onto themselves. This made me think that the organza wasn’t going to be enough to create a sturdy edge that I was going for. I added an embroidered insertion rectangle – calling upon my sewing experience and working with purchased lace used that could be added into a seam. Here is a video showing how this lace edge with the insertion feature was created in StitchArtist. If you have StitchArtist L3, the scallops could also be branched so that the underlay stitches first and then the scallops on top. There is no audio – this just shows how the branching stitches. There is a great video on how to apply branching on the Embrilliance youtube channel – I will add the link at the end of this post. 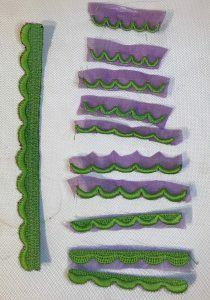 The final size of the embroidered insertion edges are based upon the long edges of the flap. This design was stitched on organza and the edges were sealed using a stencil burner. I embroidered one for each edge of the flap and set them aside until I was ready to construct the flap. Yes, I used the same color thread in top and bobbin so that the edging is “reversible” but there is a right and wrong side to the edge and would need to be careful that the right sides were facing up when the flap was complete. Next up, I’ll show you how I created my stylized initial “L” from my hand writing.